Bound for Grand Haven in tow of tug PRODIGY. 1853-54 Enrolled French Creek, NY. 1854 Enrolled Cape Vincent District. 1854, Dec 4 Ashore Stoney Point, Lake Ontario. 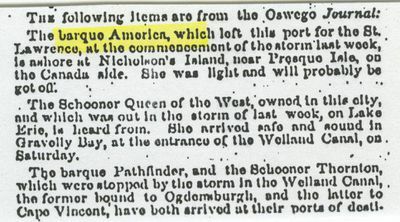 1854, Dec 15 Ashore Webster without cargo. 1855, Jan 30 Gotten off shore & taken to Genessee River for winter. 1860 Owned B.M. Norton & Co., Racine, WI. 1863 Owned W. Luddington, Chicago. 1864-65 Owned Barbara Brissach, Chicago. 1866 Owned W. Luddington, Chicago. 1868-69 Large repairs; 270 gross/257 net tons. 1871 Owned Richard Clark & Co., Chicago. 1872 Rebuilt as 3-mast schooner. 1875-76 Owned Charnley Bros. & Co., Chicago (owned Lumbermill at Sturgeon Bay). 1879 Owned Charnley Bros. & Co.
1886 Jul 6 Ashore near Cross Village, Lake Michigan with corn; released & taken to Manitowoc. 1889, Jun Collision with steamer D.W. POWERS, near Chicago. 1889, Oct 22 Ashore south of Waukegan, IL. 1893, Sep Ashore Point Aux Barques, Lake Michigan. 1900 Owned Dunham Towing Co., Chicago; "Lost".